When your baby gets a cold, it’s awful. There are no medications that you can give them, and no way to ease their discomfort. Even most homeopathic remedies aren’t approved for use on babies. Heck, you can’t even give them a teaspoon of honey if they’re under one year old. One of the very few things you can do to help your little one’s cough, runny nose, and other cold symptoms is to use a humidifier. But with so many options on the market, which one is best? Here’s what you need to know. Use the links above to check the latest prices or read our in-depth baby humidifier reviews below. 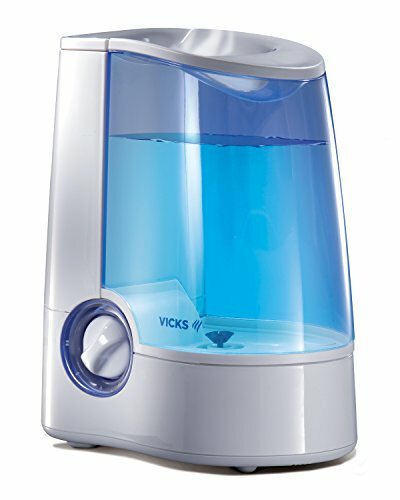 Should I Choose a Hot or Cool Water Humidifier? 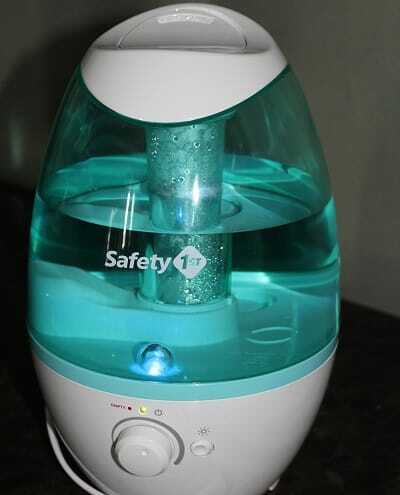 A humidifier is a device which adds moisture to the air. They’re typically used to increase internal humidity in dry climates or during the winter, or to ease symptoms of the common cold. The term “humidifier” is used interchangeably with the term “vaporizer,” however they’re two different things. 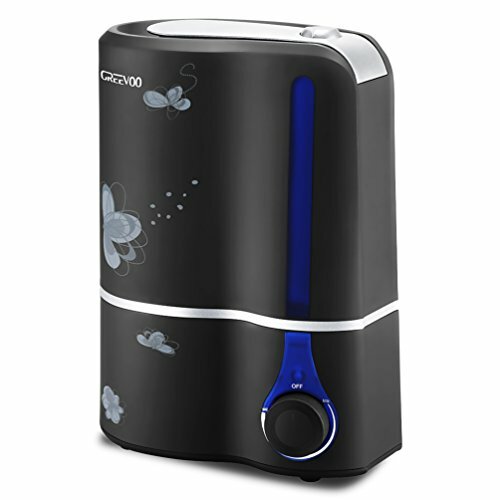 A humidifier releases a cool or room-temperature mist into the air to be absorbed. A vaporizer heats the water into hot steam, which is then released into the air. The ideal humidity level of the air is between 30 and 50 percent (source). In dry climates, the level can be significantly lower. Similarly, during the winter time when running the furnace, the air in homes can become even drier. A humidifier can help ease the symptoms of a cold naturally. Thinning the mucus, so it’s more easily expelled. Soothing a dry throat to reduce the severity of a cough. Moistening nasal passages and sinuses to promote faster healing. Using a humidifier can not only help your baby (and the rest of your family) endure and recover from a cold, but it also has preventative health benefits. Humidity significantly hinders the ability of airborne viruses to travel, so keeping your air moist can help prevent your family from catching the flu, colds, or other icky bugs that always make the rounds during the winter. Both vaporizers and humidifiers introduce moisture into the dry air in your home — and they do it equally effectively. They’re also equally effective on your baby’s cold symptoms. By the time the moist air is inhaled into their nasal passages, both the “cool mist” or “hot steam” are equal, and match your baby’s body temperature. 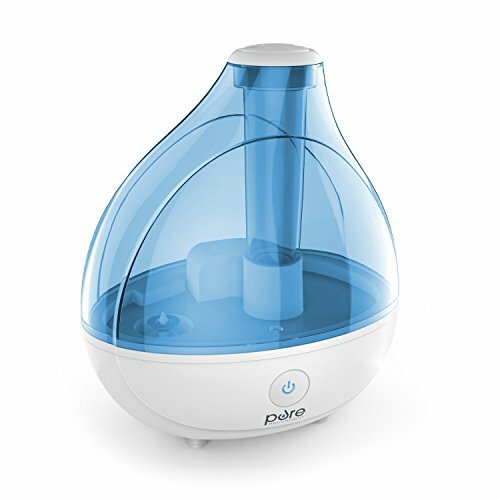 A few years ago, many pediatricians (including my own) began exclusively recommending cool mist humidifiers. The reason for this was because the respiratory benefits to a sick baby were the same as steam vaporizers, but they were much safer. Steam vaporizers heat water to the point that has the potential to burn a small child, so most professionals decided they just weren’t worth the risk. However, there are definitely benefits to the steam vaporizer. Because of the high heat, bacteria and other potential allergens are killed before expelling the water into the air. For this reason, if you have a child who suffers from severe allergies, you may want to consider a steam vaporizer if you can place it out of their reach and ensure they’ll be safe. When using a humidifier, there are a few things you need to be aware of. ​Burn Risk: Hot-water vaporizers are generally more hygienic as the water is heated to steam that is hot enough to kill potential bacteria (source). However, they also pose a burn risk for small children. If you choose a hot-water vaporizer, make sure it’s out of reach of your child. 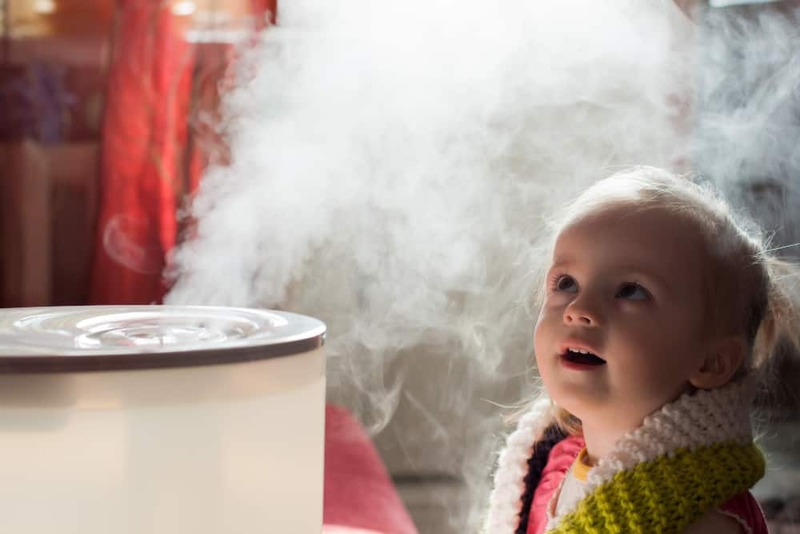 If there’s no way to ensure your small child can’t have access to the vaporizer, opt for a cool mist humidifier. Cleanliness: If your model has a filter, you need to clean or replace it periodically. In any product that holds water, bacteria and mold have the potential to grow, which can cause health problems. Make sure you keep it clean and well-maintained to prevent unwanted health issues. Over-Moisturizing: If you introduce too much moisture into the air, it can cause mold and other allergens to grow in your child’s room or other areas of your home. You can purchase a hygrometer at any home improvement store to monitor the moisture level and prevent it from becoming too high; 30-50% is ideal for health, while 43% has been shown to be the ideal level to prevent the travel of airborne bacteria and viruses (source). Consider using filtered water in your humidifier to give it a longer lifespan. Tap water can cause mineral buildup inside the machine, making cleaning more difficult and causing unnecessary wear and tear over time. Cool Mist or Hot Steam: Decide whether you’d prefer a cool mist or hot steam unit. Generally, “vaporizer” means it will emit hot steam, while “humidifier” means it will expel a cool mist. However, sometimes the terms are used interchangeably so make sure you read the product details thoroughly. Filter or No Filter: A built-in filter will keep potential irritants out of the air, but it can also be a source of ill health if it’s not kept clean. If you choose one with a filter, be prepared to clean it regularly, or else be prepared for the ongoing expense of replacing it. Effective Area: Each humidifier has a different sized area for which it’s suitable. If you’re just using it in your baby’s room, a machine that covers a 100 square foot area may be suitable. If you’re planning to use it in your main bedroom, you’ll need something larger. Built-In Diffuser: Some humidifiers can be paired with a scent or oil, emitting a pleasing aroma, offering health benefits, or just helping to ease congestion. Depending on the brand and model, you may be required to purchase their specific diffusing product. If you want a simple humidifier to add moisture to the air, skip ones with this particular feature. Humidifiers and vaporizers are one of those little luxuries in life that you’ll soon wonder how you ever coped without. Moist air can make all the difference when it comes to overcoming nagging coughs or stuffy noses — not just for your baby, but for your whole family. These are our favorite models currently on the market. When your baby is congested, you feel powerless to make them feel better. A humidifier can help to thin the mucus and soothe their nasal passages. If you choose one that has eucalyptus or menthol inserts, they may help to further clear the nasal passages — just make sure their use is approved for the age of your particular baby. This easy-to-operate humidifier has a visible reservoir so you know exactly when you need to replenish the water. You won’t have to do it that often, though, because one fill-up can make the unit run for up to 30 hours. If you do let it run dry, it will shut off automatically so the machine won’t be damaged. It’s designed to be used with Vicks Scent Pads, which can introduce menthol or lavender into the air to soothe your little one (although first verify that this is appropriate for your baby’s age group). There are no filters to replace and few safety concerns as the water is atomized into a mist by a high-frequency vibrating plate rather than creating heat and steam. You can also control the mist output with a simple, foolproof dial design — dial-up for more mist, dial down for less. You can use Vicks Scent Pads. It has a large opening for easy cleaning. Runs for up to 30 hours. You can control the humidity level. Not compatible with essential oils. It doesn’t kill bacteria as it’s cool mist. Babies with coughs or stuffy noses often need humidifiers at night to help them sleep soundly. Thanks to this humidifier for Pure Enrichment they can also enjoy a peaceful and soothing ambiance as well. The tank is not only rounded and made of a clear plastic, which is aesthetically pleasing in the first place, but a simple press of the button turns it into a night light. With a soft glow, it can help calm your baby as they struggle to sleep through the night. You can fit 1.5 liters of water inside and choose from high or low speed settings to adjust mist direction and intensity. Because it can run for up to 16 hours, it can be used throughout the night. However, if the water level is too low or something dislodges the water tank, the humidifier will automatically shut off to ensure your baby’s safety. Calming night light function is perfect for bedtime. Runs for up to 16 hours, so it’ll last through the night. Multiple settings ensure the perfect moisture level for your situation. Moms note the small tank opening makes it hard to clean. At first, you may think humidifiers remain clean because of all the water you put inside. But think of all the germs and gunk in the air it’s trapping so you don’t breathe it in! 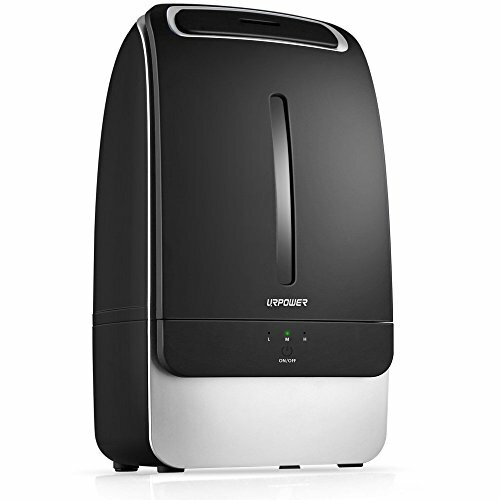 Cleaning a humidifier is important to how effective it is and the extra large opening on this Honeywell humidifier lets you do just that. Because the opening on the water tank is so large, you can fit your hand inside. This allows you to scrub more effectively and get into those hard-to-reach nook and crannies. It also means you can fill it up without worrying about spills. It’s a cool mist humidifier complete with a one gallon tank and uses UV light technology to kill germs. Move it from the sink to your baby’s room easily thanks to the large recessed tank handle. If you use a humidifier consistently, this is an easy-to-clean option that won’t add extra stress to your life. Extra large tank opening makes cleaning easy. Carry handle allows for comfortable transport throughout the house. UV light kills germs, bacteria, mold, and more. The replacement filters for this unit are not at a great price point for moms on a budget. Choosing a warm air humidifier is a good choice because they're generally cleaner. The heating process kills any bacteria in the water before it's released into the air; just make sure you pick one that has a long enough cord to put it up safely out of reach of your little one. 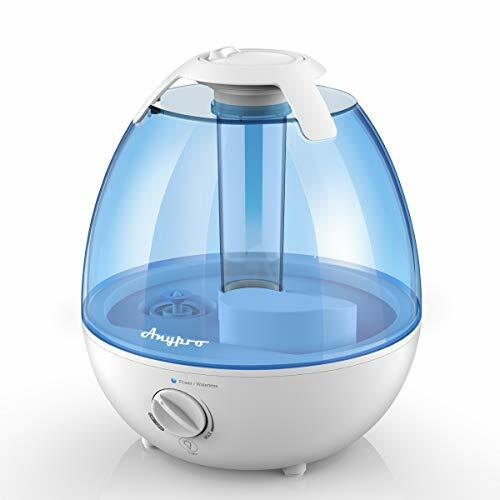 This warm mist humidifier has a one-gallon capacity that will last for 12 hours, which is plenty of time to make it through the whole night. But if you forget to refill it, no worries — it has an automatic shutoff in the event it empties. It also has a medicine cup, allowing it to produce a medicated vapor to ease your child’s congestion if they’re sick, and a nightlight to scare away those monsters! You can adjust the flow of the steam between 2 comfort settings, and the tank is designed to empty completely (without leaving standing water) to reduce the chance of bacterial growth. It empties completely, which is more hygienic. It has a handy nightlight. You can use in conjunction with medicated inhalants. Hot steam kills 95 percent of germs. Nightlight does not turn off. You’ll need to clean it occasionally. You must keep it out of the reach of children to prevent burns. Do you need to a humidifier to work in a particularly large room? Or maybe you need it to run for a longer time? 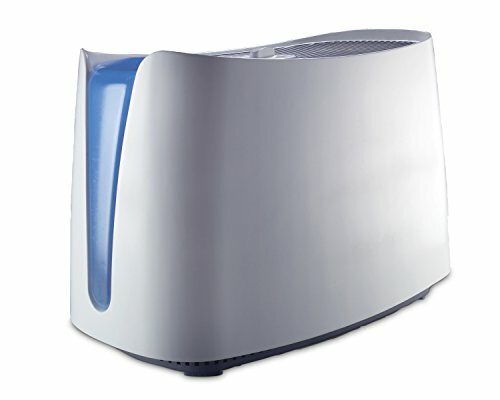 If so, an extra large humidifier is the way to go and we suggest this one from TaoTronics. With a four liter tank, it will work for up to 30 hours. This is great for moms at home who need continuous, refreshing air. Better yet, the built-in humidity monitor keeps track of your air quality so you can choose the correct settings throughout the day and enjoy long-lasting comfort. We also love how quiet this humidifier is. Because it’s ultrasonic, it’s incredibly silent and won’t bother your baby when they’re trying to sleep. Combined with the extra large tank, you can use it at night without any fuss. The tank may hold up to four liters, but the entire humidifier itself isn’t very bulky so you don’t have to worry about it taking up extra space in your home. Large water tank gives you 30 hours of operation. Incredible silent and great for bedtime. Includes a built-in humidity monitor. If you use regular tap water in the tank, you’ll see more white dust produced. You’ve got enough on your plate — you don’t want to worry about cleaning or replacing humidifier filters, too. To avoid putting impurities into the air (since they won’t be filtered out), you may want to consider using purified or demineralized water when operating your humidifier. Many humidifiers work with a filter, something you will then have to purchase and change out on a regular basis. Skip the stress and avoid a filter altogether with the Crane USA Humidifier. It doesn’t require a filter to function properly, saving you time and money. However, if you have super hard water, a filter can be inserted to avoid damaging the piece. Make sure to figure out what your water is like before putting it in the humidifier. Overall, it holds up to a gallon of water and uses vibrations to produce a cool mist good for relieving the symptoms of coughs, colds, dry skin, and more. Because the mist isn’t heated, it’s especially good for your baby’s delicate skin. We also really appreciate the 360 degree lid, which allows you to direct the mist where you need it the most. It’s whisper quiet and can run for up to 24 hours. No filters mean you save time and money. Holds up to a gallon of water and can run for 24 hours. 360 degree lid allows mist to be directed. No filter mean you’ll have to keep an eye on how dirty the inside of the humidifier gets, leading to more cleaning. Cool mist humidifiers are great for little ones because you don’t have to worry about potential burns. The health benefits are the same as the vapors will warm up to their body temperature once they breathe them in. 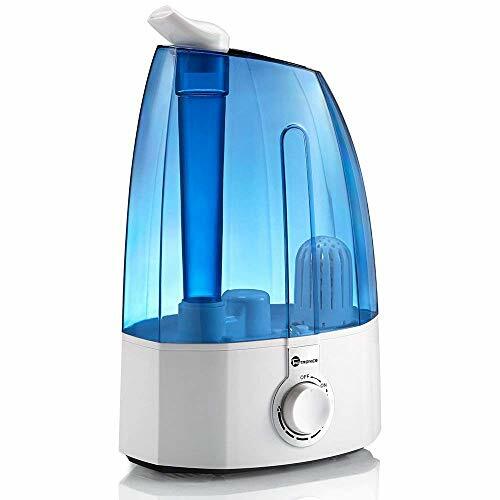 This cool mist humidifier will moisturize your air for between 20-36 hours, so you know that it’ll operate continuously throughout the night without you needing to refill it constantly. The long mist stream will prevent water from pooling on the floor and help ensure it’s absorbed and distributed as desired. The nozzle rotates 360 degrees so you can adjust the mist without having to move the machine, and it will help to humidify medium to large sized rooms. Constructed from antibacterial materials, the unit won’t grow (or expel) mold or other bacteria, and it provides moisture through ultrasonic technology, so you don’t have to worry about your little one burning themselves if they get too close. It’s ultrasonic, so it’s very quiet. It has a night light with 6 color options. The design can be difficult to clean. It may leave fine dust. It’s recommended that you use distilled water. An ultrasonic humidifier produces a mist using high-frequency sound vibrations. They're generally quieter than other units, and safer for small children than hot vapor designs. They also tend not to have a filter, making them more expensive upfront but cheaper to operate in the long run. However, you may want to consider using demineralized water to prevent a fine “white dust” that tends to occur when using ultrasonic humidifiers, caused by minerals found in tap water. This humidifier makes operation a breeze with a single-touch on/off switch and clear, well-lit indicators for low/medium/high mist output. The five-liter holding tank means it easily operates for more than half a day without needing a refill, and the sleek black design fits in easily with many types of decor. It shuts off automatically when empty so it won’t burn out the motor, and the quiet operation won’t interfere with your baby’s sleep. And since it’s ultrasonic, the mist it releases will be cool — there are no hot elements — to maintain your little one’s safety. There’s also no filter, so ongoing maintenance is minimal. There are no heating elements. It has an automatic shutoff. It has a sleek, modern design. It only lasts half a day. You must clean the unit every 3-5 uses. If your little one has allergies, you’ll want to pay close attention to the humidity levels in your home. Keep it between 30-50 percent; any further and you may promote mold growth. You may also want to consider a steam vaporizer, which heats the water to a level that will kill mold spores, bacteria, and other allergens. However, if you’re not confident in your ability to keep it out of your baby’s reach, opt for a cool mist humidifier with a filter. This humidifying unit kills up to 99.99% of all bacteria, molds, and spores — which means they won’t be expelled into the air to irritate your child’s sensitive respiratory system. It does this in two ways — first, through the steam vapor and second, through the ultraviolet light chamber in the water tank. Because it has two tanks, it can run longer (up to 24 hours) on one filling. The tanks are nicely sized so you can fill them up in your sink, unlike some other models that are too bulky and need to be filled up in the bathtub. It runs super quietly and won’t disturb your (or your baby’s) sleep. This also has a “medicine cup” where you can use compatible products, though some have also used the cup for essential oils, and since it’s not inside the machine this should not affect its operation. It runs for 24 hours. It can be filled up easily in your sink. The light on the front is very bright. Carrying two reservoirs to fill could be cumbersome. Is heating your house during the winter causing your child to have a dry throat, irritated nasal passages, or even nosebleeds? 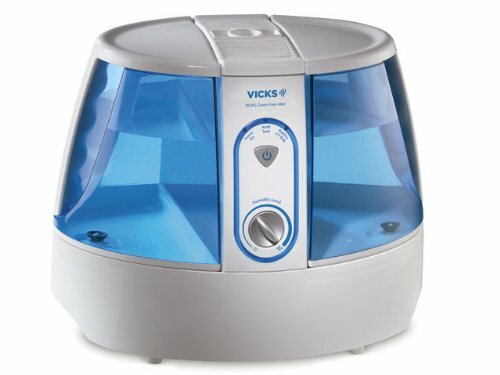 My child suffers from nose bleeds constantly every winter if I don’t keep a humidifier running in his bedroom at night. Because I don’t want a trip to the ER if my child accidentally knocks over a warm mist humidifier and burns himself, I use a cool mist humidifier. Always on the lookout for new humidifiers, I decided to check out the Safety 1st soothing glow cool mist humidifier. I liked the idea of not having to monopolize the whole electrical outlet with a nightlight and a humidifier, when one unit could take care of both functions. And the glow from this one is just right – it’s not too bright, but it’s also enough to prevent stubbed toes for me when I wander in to see if he has kicked off his blankets and needs to be tucked back in. After giving this unit a test run, I was pleased with it. The tank was easy to fill and one tank lasted about three nights at the setting I use. The humidifier offers 360-degree mist outlet which lets you position it anywhere. You don’t have to replace any filters. It’s easy to clean, which is a good thing for keeping germs at bay. If you use it at its highest setting, you’ll need to fill it frequently. Try it at its lowest setting first to see if it does the trick for you. Sometimes, simple is best. 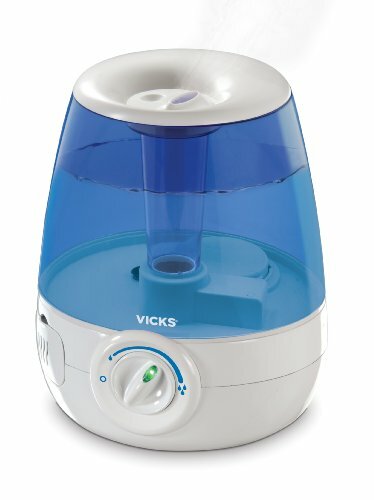 The Vicks FilterFree Humidifier is easy to operate, easy to refill, and easy to clean. It has no filter that you need to replace, and the opening into the water chamber is large enough so that your regular cleaning sessions (which you’ll have to do no matter what unit you choose) are a breeze. It’s also compatible with medicated, scented pads to ease congestion and because it’s a cool mist humidifier, you’ll be at ease knowing there’s no burn risk to your baby. There are a few tricks you can try when your baby comes down with a cold, and using a humidifier is at the very top of that list. Not only can moist air make your babe more comfortable, but it can also help them heal faster — and stay well longer. That’s well worth the upfront investment of a humidifier if you ask me. Have you had any success with a humidifier, vaporizer or diffuser? Also, please feel free to share any tips on how you deal with a cranky baby with a cold! What Can I Do For My Baby’s Stuffy Nose? My daughter and her baby live with me. As a father and grandpa, it is my duty to look after them. But my grandchild was getting sick in my house. Because the area we live in is very dry. She was having trouble breathing and sleeping. Buying a cool mist humidifier definitely has helped her a lot though. 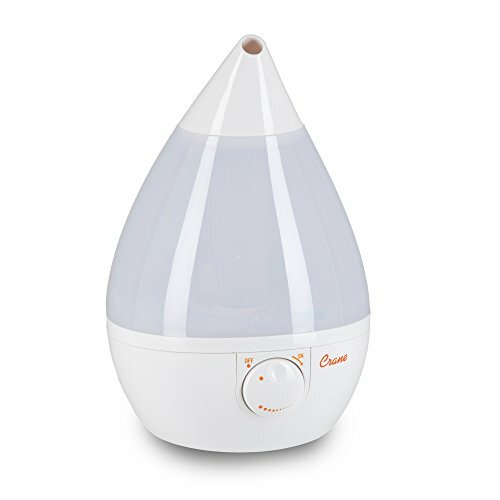 I’m looking for an oil humidifier for infants. Any ideas? Oh dear, Alex. Sorry your little one isn’t feeling well. We hope things improve soon, and that a humidifier helps too. Thanks for reading and commenting! Let us know how your baby fares, please.